This post is sponsored by StriVectin however all thoughts and opinions are my own. 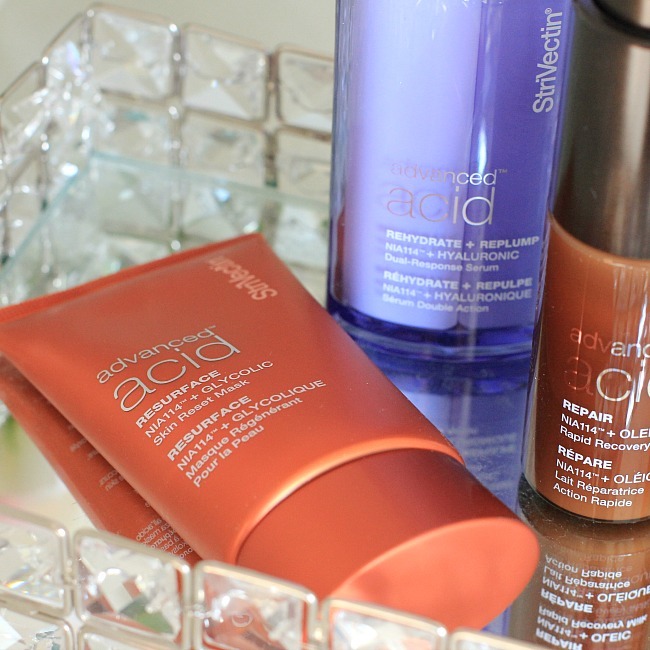 The Advanced Acids line is comprised of three products: Skin Reset Mask, Rapid Recovery Milk & Dual-Response Serum. This skin care line is designed to target aging skin with the changing agents of Advanced Acids to help bring about results. Below I have photographed the three textures of the products to give you an idea of their consistency. The Skin Reset Mask being thick, the Rapid Recovery Milk is a thinner/milkier consistency and the Dual-Response Serum is smooth but binding. 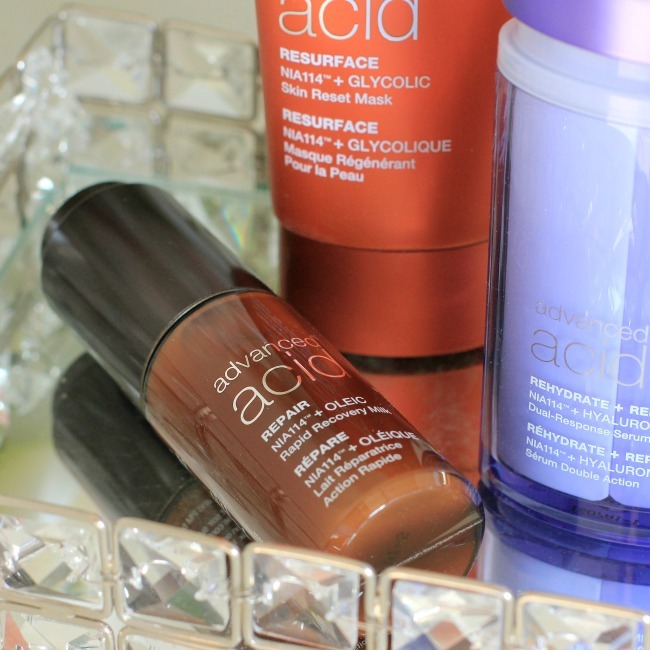 The Advanced Acid Skin Reset Mask is a product you only use once to twice a week. It is a five minute Glycolic resurfacing mask that helps to retexturize the surface of your skin. Pairing the most effective of the alpha hydroxy acids (Glycolic Acid) with the NIA114 which is a StriVectin patented molecule it resurfaces your skin without being granular and harsh. You will see results in just five minutes but the slow release Glycolic will continue to work on rejuvenating skin cells. What is nice about this mask is that your skin is not left feeling raw and irritated but rather moisturized and glowing. The Advanced Acid Rapid Recovery Milk pairs that same patented NIA114 molecule with Oleic Acid which is an Omega-9 fatty acid. 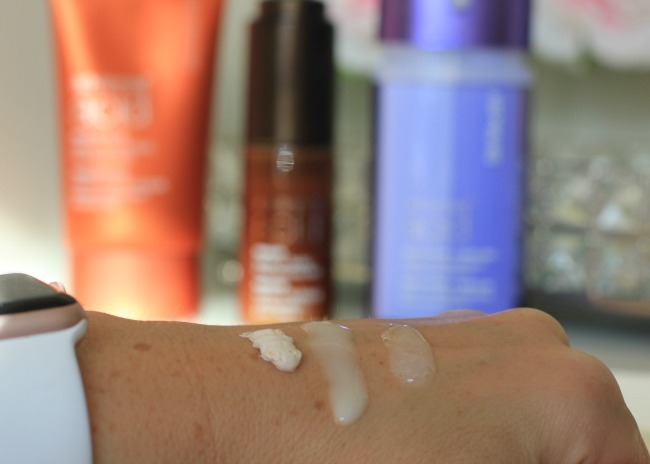 This pairing helps to replenish the skin's outermost moisture layer. This milk works with the strength of an oil but is soothing and nourishing like a milk. This repair helps skin retain a more youthful appearance by restoring the skin's resiliency. Use this product after cleansing in the morning and at night. The hydrating component helps your makeup application look amazing thanks to the plumping and moisturizing of your skin. Last product in the Advanced Acid collection is the Dual-Response Serum. This serum pairs the NIA114 with Hyaluronic Acid which is a hydrating molecule that can hold 1,000 times its weight in water! This pairing makes for an effective dual-action product to help moisturize dehydrated skin and sustain that hydration. 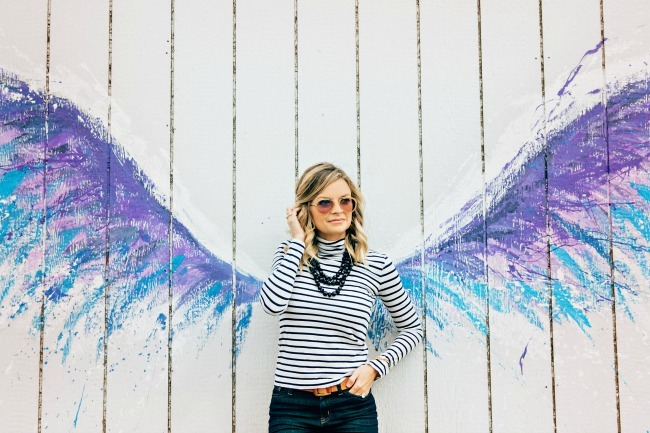 If you are like me the winter months are brutal in dehydrating my skin and need products that are jam packed with moisturizing ingredients to help me maintain smooth, moisturized and youthful skin. This Dual-Response Serum is just the product. 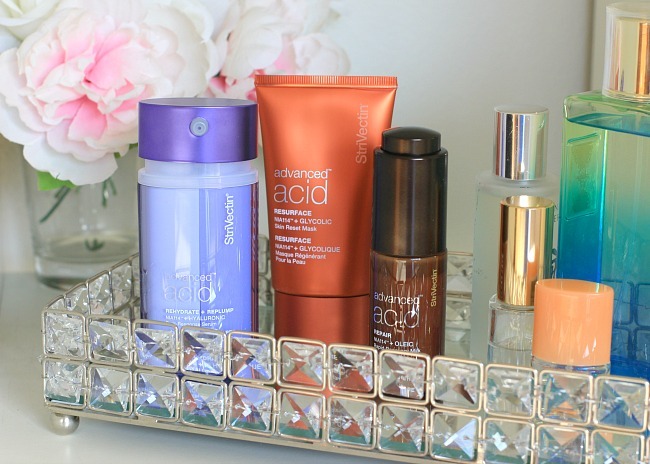 Using all of these Advanced Acid products in my skincare routine help packs a mean punch against aging. 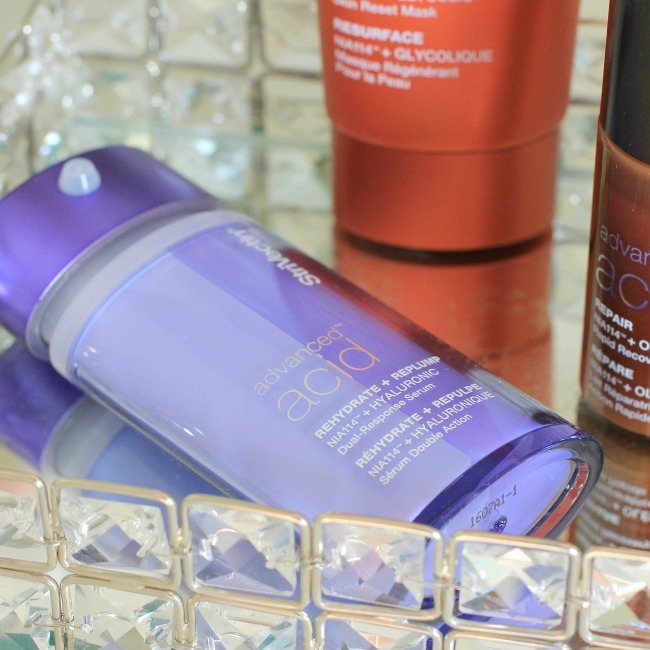 My skin feels better, looks better and wears makeup better after using these products. This momma couldn't be happier with the results.